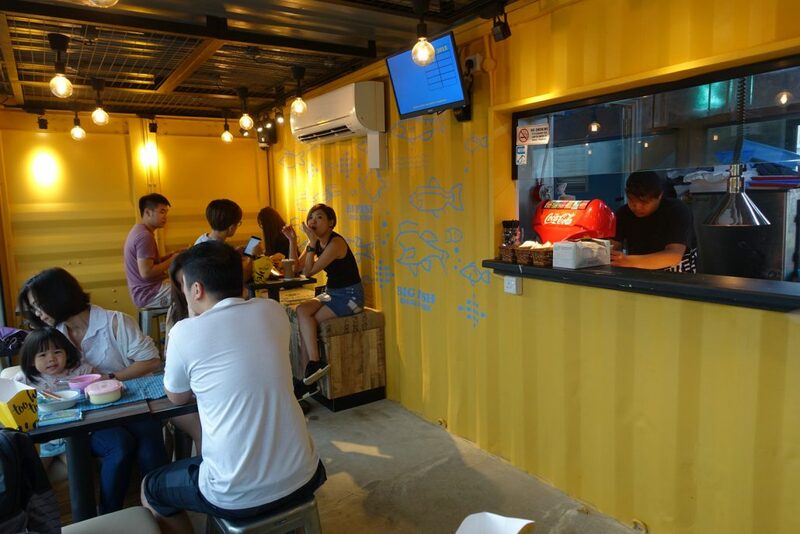 It has been a long time since I wanted to visit the new container-themed bistro park at Tebing lane. But it was always too far for us! Finally, we managed to make a trip down to explore this new place. 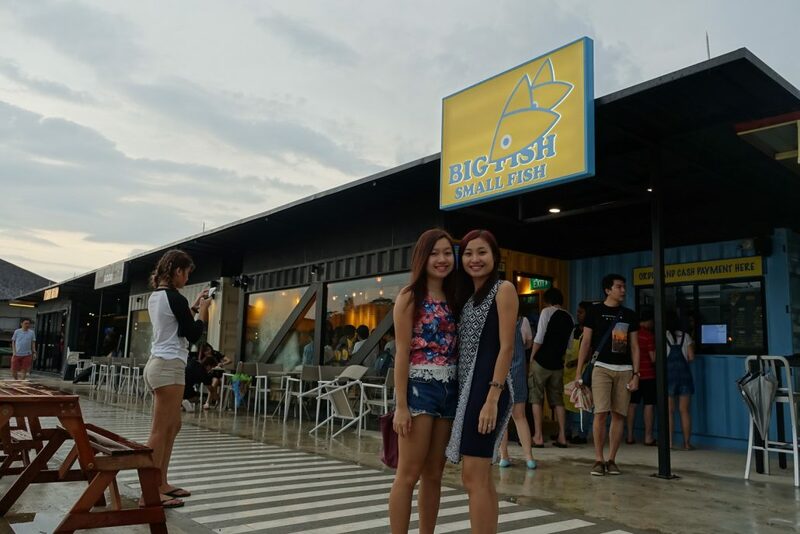 Big Fish Small Fish is one of the seven container eateries lined neatly in a row. Even though it was only 5 pm, it was already bustling with people. We quickly joined the queue before the crowd starts to flow in! Which one should I choose! Our choice was SEA BASS! 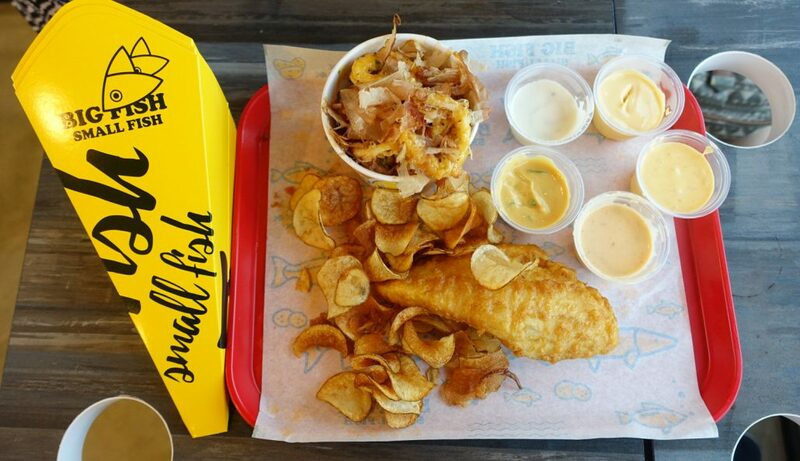 If you don’t know which one to order, try the sea bass! Because it was sooo GOOD! !👍👍 I will not recommend Dory even though it’s the cheapest as it is frozen and processed battered fish. Don’t believe me? Scroll down to see the sea bass lor! 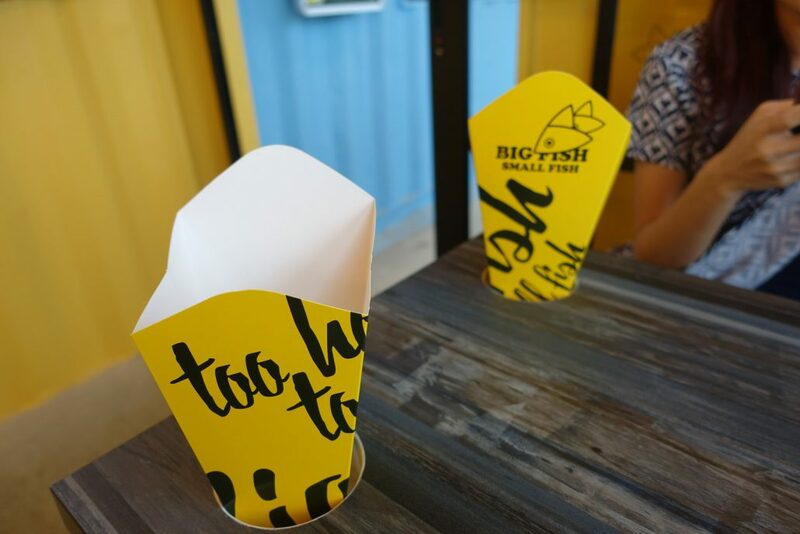 Indoor seating area at Big Fish Small Fish. If you visit during the day, sit inside (super hot outside)! At night, the atmosphere outside is better! Collect your food from this hole! Do expect some waiting time especially during meal time. My friend here came yesterday told me that she waited for an hour! Thank Goodness, we went early and the queue was not that bad! PHEW! We waited for about 15 minutes! Does it remind you of the childhood game “big fish small fish” HAHA! You can play while waiting for your food! 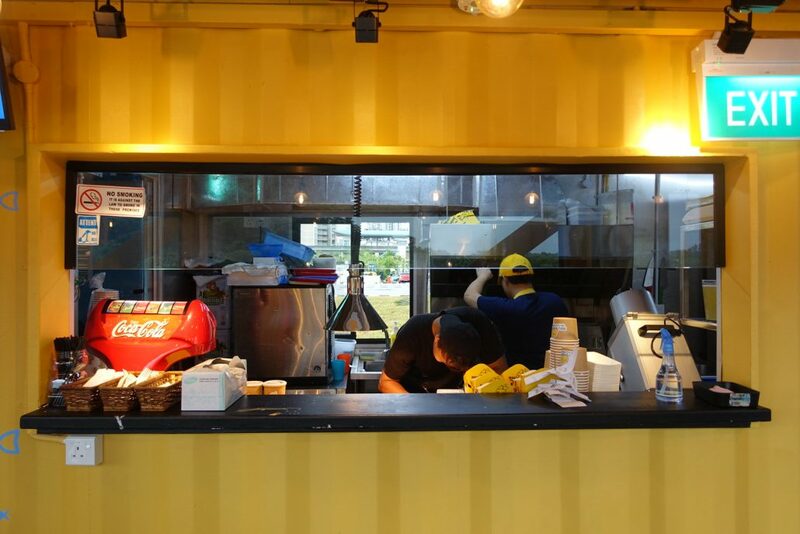 Finally, our food is here! 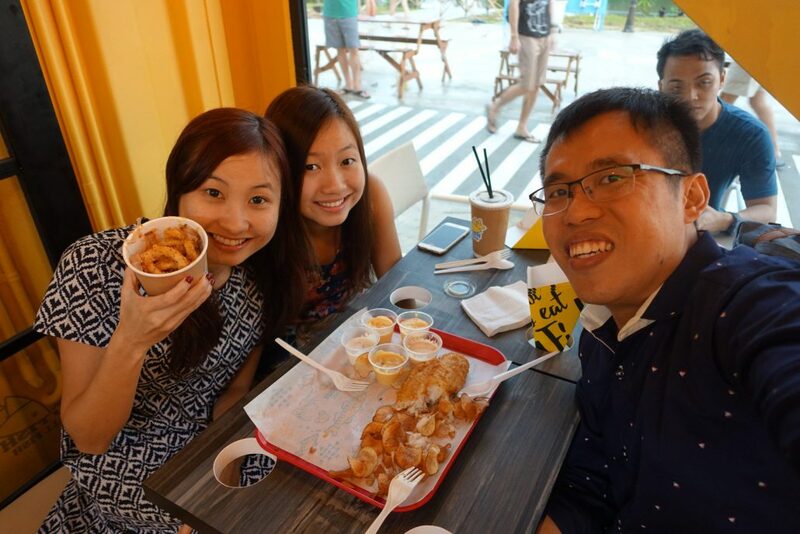 We ordered the Seabass ($9.90) and Salted Egg Fried Calamari with Dried Bonito Flakes ($7.90)! 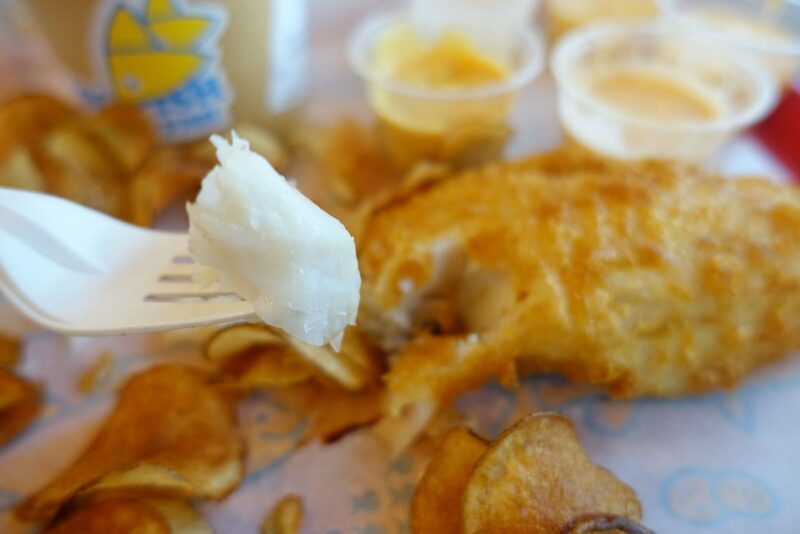 This is how you should eat the fish and chip! 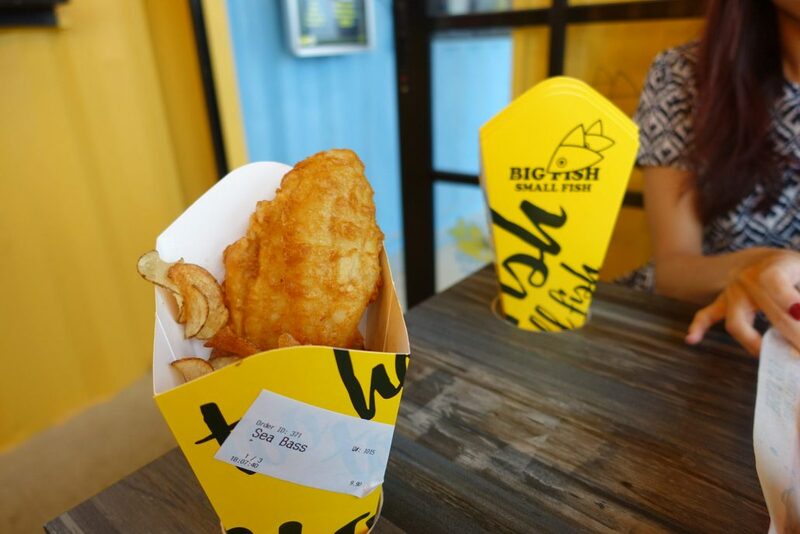 The fishes are served in a cone and practice here at Big Fish Small Fish is to eat it from the cone! Thus, the holes in the table are for you to put the fish and chip. Tadaa! 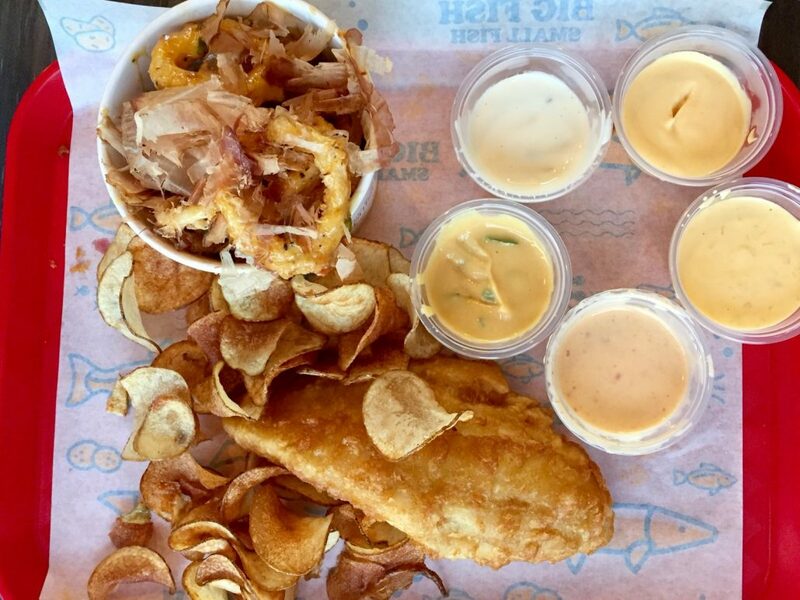 We poured out our fish and chips on the tray and opened all the different dips! 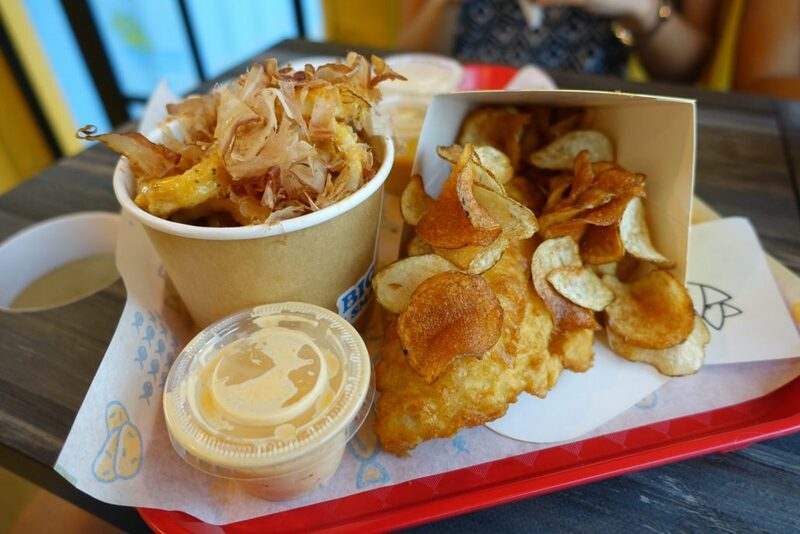 Seabass, chips, salted egg calamari and dips! 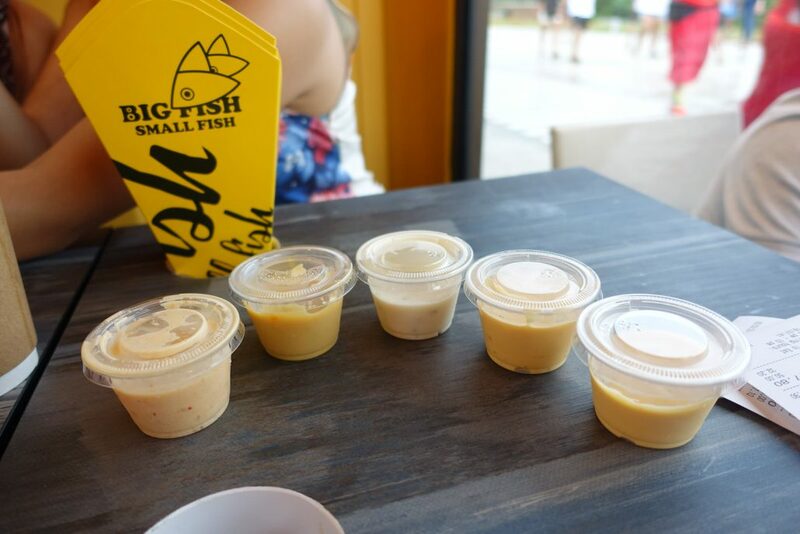 Despite having different types of fish to suit your taste bud, Big Fish Smal Fish differentiate itself by having a variety of sauces! In the past, the sauce was packed in individual small containers. 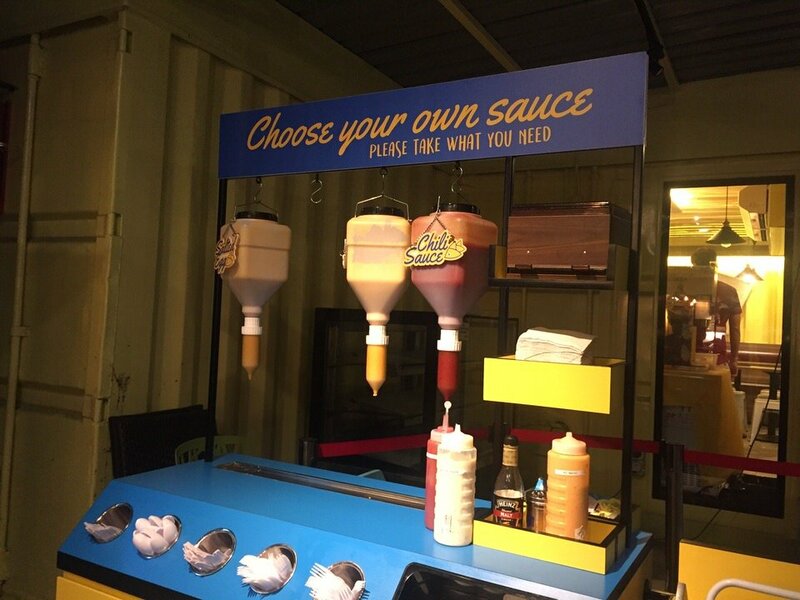 But now, there is a self-serving sauce dispenser station beside the counter for you to take your own sauce. Hopefully, this will help to prevent wastage! 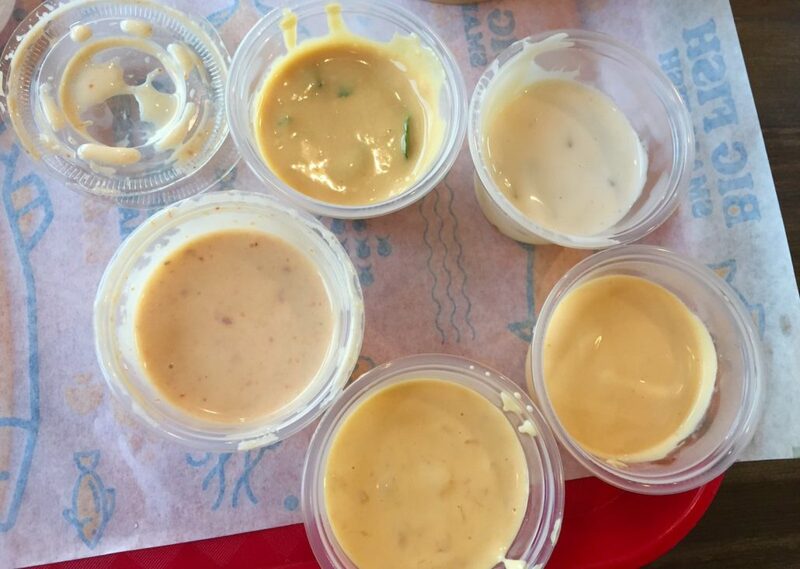 Please only take what you need before they decide to limit the amount of sauce each serving can have! The flavor of the dips was mild and light. We took some time to distinguish what sauce it was. The mozzarella cheese was more flavorful as compared to the original cheese and had a slightly sour finishing. Our favourite: Mozzarella Cheese and XO sauce! 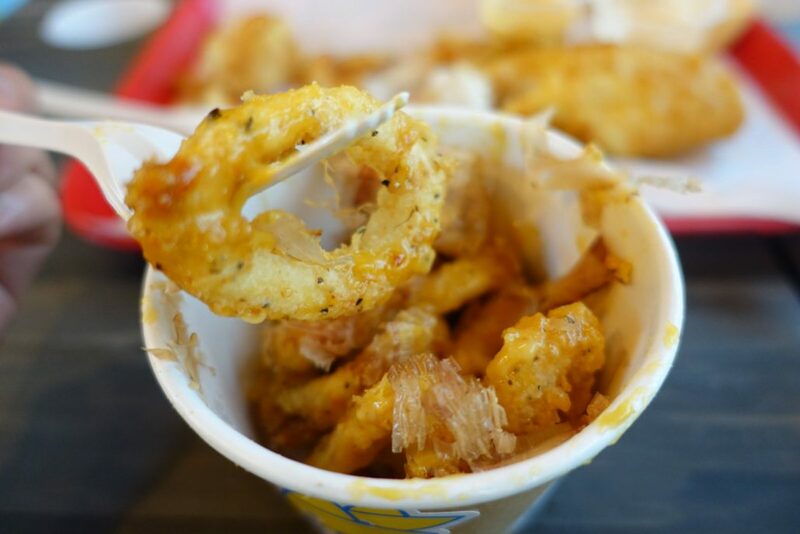 The salted egg calamari ($7.90) was decent, nice but nothing to go crazy about! In fact I was expecting it to be better, there isn’t much of salted egg in the sauce. It’s disappointing to see everywhere selling food with salted egg but lacks quality. 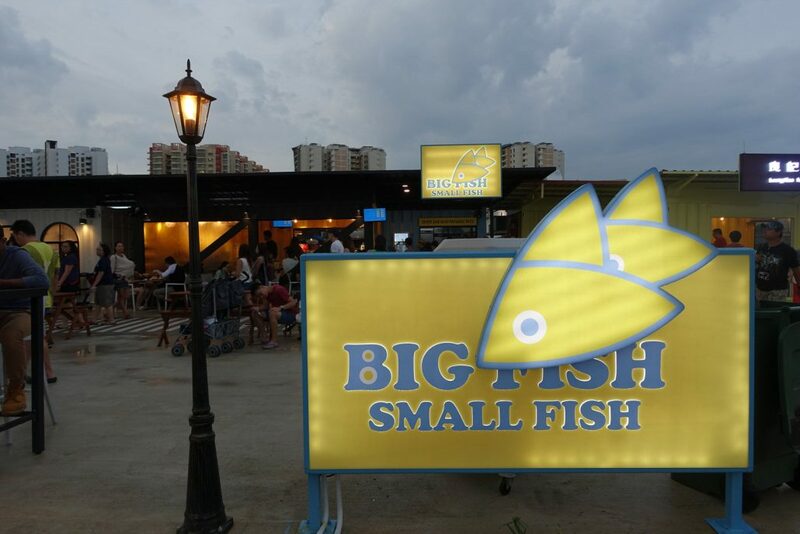 All I can say is Big Fish Small Fish isn’t popular just because it is newly open or because it is a new concept eatery. 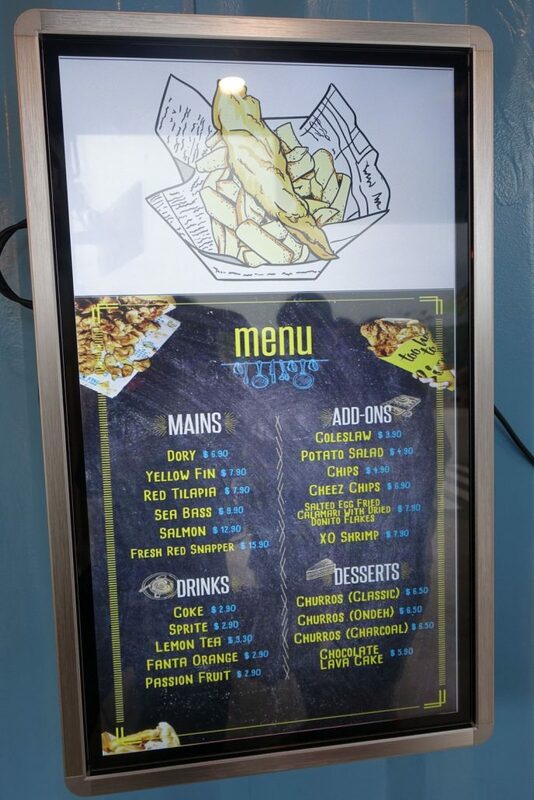 It is the freshest and quality of fish and chip! Being beside the Punggol park, the environment was also pretty enjoyable, with trees and lakes! It can be a motivation to get some exercise! 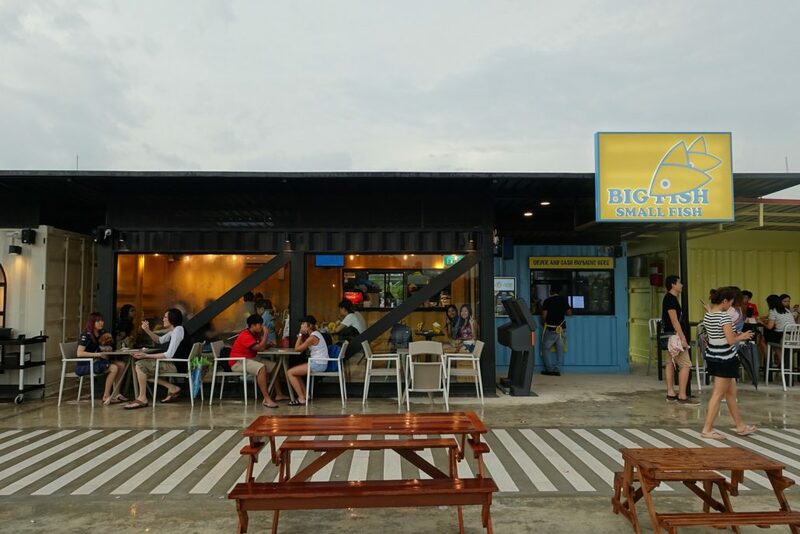 🏃🏃Go for a jog at Punggol park and enjoy the sinful fish and chip at Big Fish Small Fish to replenish your calories! NOTCHBAD Tip: Go during off-peak hours if possible. 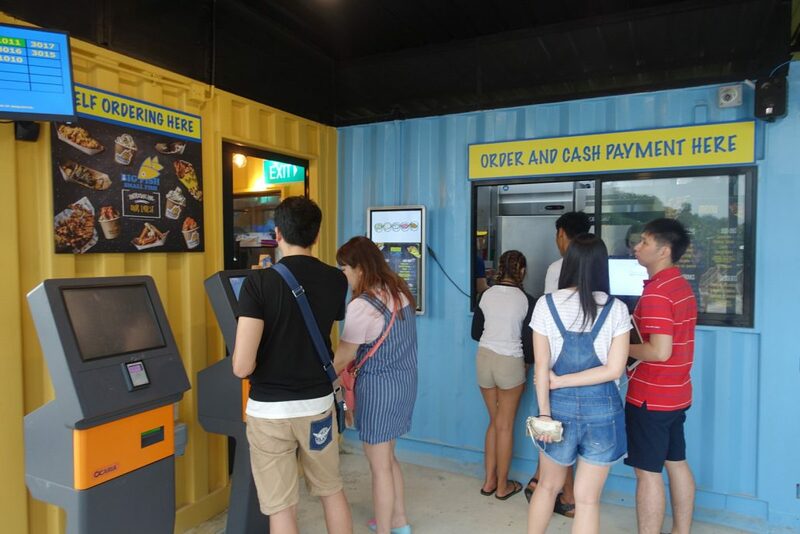 expect long waiting time during peak hours(at least 40 mins)! Sounds like a good plan! Doesn’t it!